I had a good day.. didn't win pro class ..but finished well.. looks like a keeper score. I still find it hard to believe two drivers lost it in a straight a way section of the course, causing timing down time.. wow. Glad we went up hill today.. or I guess we wud have had to fish two cars out of the lake..! Wow what could go wrong did and it went wrong 3-4 times each time. Sorry for the long day my fellow autoxers. We will have the run groups 1 and 2 times up as soon as we can. Run group 3 hit 97 cones, I have not seen that many cones hit in one run group in a long time and I am sure that the other run groups probably got close to that or maybe more cones as well. We tried a little some thing different with the course design and I think maybe a few liked it and a few maybe not so much. Hopefully we can try and keep the timing cords out of harms way next time....lol Don't forget about event 9 at adessa on Oct. 4th as we don't get to run there but once a year and it is usually a great event at a different site. See every one at adessa and we will get the winners and runner ups there T-Shirts as soon as we get the results. Thanks again to all who stayed the course and made a long day a good day. Great stuff, can't wait until the event on the 4th. The poly diff bushings made an absolutely fantastic difference in car feel. Check out some of the build. Nothing wrong with the course,If the start was not correct then down cones in first slalom, same after first right sweeper to second slalom.The top was go fast and kink wide for left sweeper and tight out. I think but it worked for me.I understand the first cable killer due to auto trans shift to second and light on rear but, never mind. GLAD WE DONE .Cold beer is tasting real good.right now. Thank everyone for today. I really enjoyed today's course, it was quick yet deceptively challenging. A welcome change from the usual setup that we run. As part of the timing crew, my apologies to everyone for the delays. There must have been increased solar flare activity today causing the computers to act up. Nothing we tried whenever axware got finnicky seemed to work. Thank you all for being patient with us through all the delays. benk wrote: I really enjoyed today's course, it was quick yet deceptively challenging. A welcome change from the usual setup that we run. As part of the timing crew, my apologies to everyone for the delays. There must have been increased solar flare activity today causing the computers to act up. Nothing we tried whenever axware got finnicky seemed to work. Thank you all for being patient with us through all the delays. So, walking the course this morning I said to another driver.... "I'm not liking the looks of those timing wires... don't be _that guy_"
I agree, that was a much more balanced course than we've had but that's not a cut on the other ones. The 1st slalom was allot tighter than it walked ( to me ) but rewarded patience and keeping yourself ahead of the turns. The uphill section... well I think no matter what we did there, that if we put cones in some spots it would have really sucked for low HP cars, and if you move it another way, everyone would be flying at the curbs. Between the timing issues, then displays not working, etc I was starting to get "meh" about the day. that's the 1st time I've done my 3 runs and bailed on the other ones. I always prefer the seat time even if they don't count. The weather was nice and the turnout was good too. I didn't drive terrible but there was TONS of time left out there for my car and my driving. Not ONE of the runs I did was a decent complete run. Cathers and Berry were FLYING out there. Watching them do the uphill portion was amazing. I'm glad they went 1st so I could see that it could be done. I had a couple runs going up thru there where I was really holding my breath that I was going to get stopped. So.. this was most likely the last event this year for me in MY car. It's really starting to make noises and smells. Ted came by asking about a knocking sound on acceleration coming up the hill, but watching the videos, I can't hear anything. The car does make some chattering kinds of sounds on load at times, but we'll see. The gearbox needs gone thru ( thanks to grid for letting me line up with the 2-drivers ) and there's a list of parts that will be replaced, repaired, over the next 2 months. Walter offered up his car for a co-drive, so that might be fun. Think if I DO hop in cars, maybe go for some different rides. I'll get the video posted soon. Course was busy, but fun. 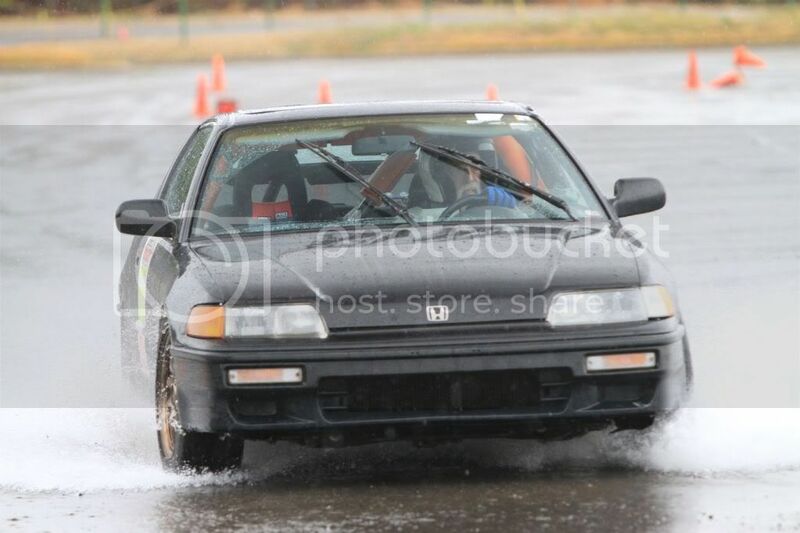 After trying to immerse myself in Jed's car, it took a while to get used to the steering on the CRX and I coned my 3 runs that count, but I was super happy with my pace. I want to show/remind people that I can be fast. It was also exciting discussing the course with Cody and seeing him execute and drop some time. I'm trying to be more analytical with my driving, so positive feedback is good. To those who made it out for the first time today, our events don't normally run anywhere near that long. I'll bet we were delayed 2 hours today for all the various issues that came up. This was really unusual and we are already working on things to fix. It was good to see something really different there at Pellissippi. I wasn't a fan of the run up the hill through the islands. I hope we don't do that again. The offsets through the center on the top were a welcome change and the tight slalom didn't bother me as much as it did some others. Had to be on your cones through that or it bit you. Those that ran the school yesterday know exactly what I'm talking about. Thanks to Brian and Ben for the hard work in the trailer trying to get the computer system working. Thanks to Bob for running cables, again, and again... I know others should be thanked for going above and beyond. Everyone's hard work is what kept this event going. I thought the same during my walk, and went so far as to unwind the reel and move them out another 15-20ft.... I guess I should have gone 40. I was kicking myself for realizing it was a problem and not doing more about it. I had fun today despite the delays. I was able to give Stewart a run for his money, which was way more than I thought I'd accomplish. He drove great and deserved the win, congrats again! I'll try not to make it so easy next time. jcox07 wrote: Run group 3 hit 97 cones, I have not seen that many cones hit in one run group in a long time and I am sure that the other run groups probably got close to that or maybe more cones as well. I think most of that was Ryan He's throwing off your statistics. I think having 315's on the rear made it feel faster - power oversteer on command at ~25mph is fun. Course was actually pretty fun - I needed some slow slalom practice, work on my patience and rhythm.. and the uphill/top section made up for the busy/technical bottom section. Thanks for all that got the event back up and running everytime the sh!t hit the fan.